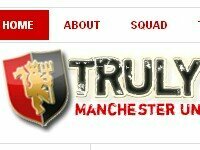 This is the un-official Manchester United fan site and personal blog. Truly Reds got its own domain in 2007 and unveiled in the 2008-2009 pre-season to be the place for the mancunia around the world to support the Red Army. This blog is where you can have your say about Manchester United, how the Lads perform and what you think that can be an improvement for the next game. You also can write a post for us expressing your view or a story about Man United. I hope you will post a comment or two on the article, shout it loud to the world you are the most passionate, greatest football supporters the world ever had!